I took advantage of yesterday's warm temperatures and took the bonehead brothers for a evening stroll. We walked about 1 mile up the Tygart River and back. It is very limited as to places that you can go, around this area. It seems that all of the private holdings around this area; which were enjoyed by all, are now cut up into little micro-hunting leases. What it amounts to, is that you have to pay about $150 and join another lease for every half-mile that you progress. The one lease that I am in is so pitiful now, that it isn't fit to be on; unless you are picking blackberries. So I figured that for a change we would walk up the river. Regretfully; I didn't take my camera and never do when I have both of the dogs on a leash. One-hundred pounds of Beagle is too much to handle and worry about breaking your camera. I know what you're thinking; yeah you can handle your dog and it is close to a hundred pounds. One dog has four pulling legs and goes in on direction and can only get tangled up on one thing. Give two going in opposite directions and tangling up and hanging each other a try some time. The highlight of the trip was 14 Ring-necked Ducks, floating in a backwater eddy. The colors of the males were magnificent. I went back this morning, hoping for one good photo; but all were gone. There were a couple of pairs of mallards and geese present. One red-shouldered hawk and two turkey vultures and that was all. Overall, it was a nice walk and they never got tangled up, too bad. Early this morning, between 3 and 4am; it sounded as if every killdeer in the eastern US flew over my house. I am sure that there were numerous shorebird species mixed in and probably some very interesting stuff was flying over. All that I could hear were the killdeer and it was a steady stream for an hour or more. It makes one think of the wonders that go on in nature on a daily basis; which nobody is aware of. I just hope they don't meet up with any wind mills; before they get where they are going. This sign was put up, if I remember correctly in the summer of 2009. A nice handicapped access boardwalk and fishing pier was constructed to allow more access to the Blackwater River, along Timberline Road on the Canaan Valley National Wildlife Refuge property. This area is just off Rt. 32 in Tucker County, WV. I hate to say this, but this pretty sign has received several shotgun blasts and has apparently been the recipient of a severe beating. I didn't think to take a photo of the condition of this sign in its current state; but believe me, it isn't pretty. Do people not have anything else to do? It is sad. ﻿ Some people drive down the road of life; believing that every oncoming vehicle is their best friend. I on the other hand am one to believe that every oncoming vehicle is driven by a drug-crazed moron; yapping on a cell phone. I could be called cynical; but prefer the label of realist. Why doesn't anyone post photos of the ugly stuff out there? If we are not exposed to these things; do they not exist? Many would like to think so. 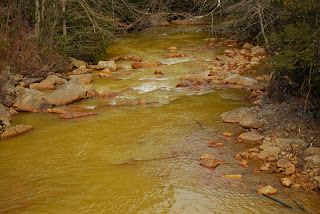 This is a photo of Roaring Creek in Randolph County, WV. It is a tributary of the Tygart River. Most of you have seen the newspaper and TV ads about beautiful downtown Coalton, WV. Well, this jewel flows right through the middle of beautiful downtown Coalton. I truly believe that if more people would become concerned with all of the bad stuff we already have; they would pay more attention to the bad things about to happen. 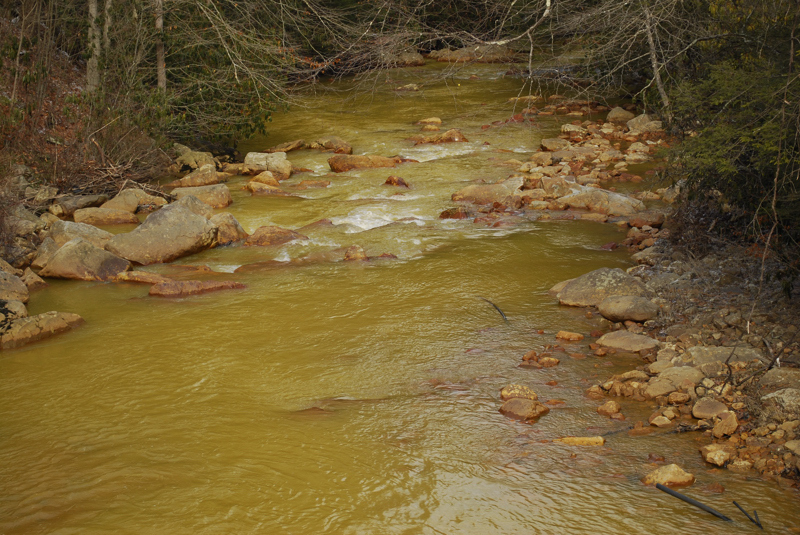 I've said it before, but here we go again; when the water quality is diminished in any way so is the quality of life. If one just chooses to ignore these things, they just don't go away. You should remember this photo; everytime you look at a pretty one. That pretty stream may not be there forever. The Great Backyard Bird Count started today, February 18, 2011. This is a great way for everyone to participate in a citizens science project and contribute information from your area. It is also, for those of the competitive nature to easily become number one in your county or town. Compiling and submitting data to the GBBC is simple and painless (I Promise) and a great way to start enjoying birding. You can spend as little as fifteen minutes per day; just observing what is going on around you. It will not hurt at all and you will actually enjoy it. You need to go out in the yard on these warm days and pick up all of the limbs and junk, so you can just be a little more observant and record your birds. Just go to the GBBC website and submit away. You may learn something and you will enjoy seeing what othere in your area have recorded. The GBBC observation dates are from Feb.18-Feb. 21. Try it; you will like it..
By the way, the American Tree Sparrow has a dot on its chest, Field Sparrows do not. See, you learned something new already. Enjoy !!! The poor old garden is in a standstill, waiting for spring, like everything else. Not much is happening down there; under the snow. But I do imagine that the chickweed continues to grow. I don't even know if my garlic emerged last fall; when it was time, it was covered with snow. Fifty degrees this morning with howling winds. Rain and snow by evenings end. One day it will stop and spring will emerge; all will rejoice. But soon after the heat will come and everything will be parched and dry. We all enjoy the fleeting days of spring; but there is always too much that needs to be done. I heard a welcome sound, when I walked outside this morning. A pair of bluebirds were tweeting from the powerline. The morning sun was bright and the temperature was around thirty, but the perception of warmth was much greater; due to what we have became accustomed to over the past few months. All of my bird houses are already cleaned out and awaiting this springs residents. One nest box has succumbed to the weight of snow and needs to be fixed. The users of my nest boxes are always welcome; no matter who they may be. Bluebirds, tree swallows and house wrens are my usual guests. I have to admit though that the tree swallows are my favorites; I just wish they would nest twice every year here, because by June; they're gone. As the days get longer, this should be your clue to get ready for your back yard visitors. Make sure your boxes are clean and securely attached to whatever they are mounted to. If you don't have any nest boxes, now is the time to put some up. Believe me; you will be rewarded by your efforts. I had some scrambled eggs and ramps today. Ramps are without a doubt the favorite and most anticipated harbinger of spring in the High Virginia's. I have never been one to harvest more than needed of anything and often come up short at the end. Especially nowadays. But, it seems that I hit the ramp harvest just right. I have two more packs in the freezer. It will be a month or so before these spring greens will be available in the Pocahontas mountains; where they are sweeter than anywhere else. But you can bet that when the snow recedes, the green will be there and so will I. The cold temperatures continue, but there is some relief in sight next week. The WVDNR has started stocking some of the smaller monthly and bi-weekly streams. These smaller waters are my favorites. Red Creek, Clover Run and Horseshoe Run in Tucker County were stocked this week. The Right Fork of Middle Fork in Upshur and the Tygart River headwater section also received trout. I came down the Tygart yesterday, the river was low and clear, with shelf ice extending from the banks and a lot of floating ice sheets. For the complete list of waters stocked this week go to WV Trout Back Creek over in Bath County was stocked this week, as was the South Branch of the Potomac in Highland County; for the complete list of Virginia trout stockings, go to VA Trout The cold morning temperatures that we have had in our region over the past week make mid-afternoon the time to be on your favorite stream. The WVDNR has stocked the tailwaters of Burnsville, Sutton and Stonewall Jackson Lakes today. The bad news is that we are going to get another round of snow tonight. In the mountains, Gandy Creek and Laurel Fork (Rt. 33 Bridge) were stocked today. Dry Fork is in good shape, I came through there today; so Gandy should be in good fishing condition. Laurel Fork is a little high. Blackwater is still ice covered and Shavers Fork is in good shape at Bowden. When is Spring ? Yeah, the calender says March 20 and that may be true in the Deep South, but it doesn't apply to the High Virginia's. For a few years, I have been trying to figure out when the morels emerge. I have finally discovered the first day of Spring; for wherever you may call home. I noticed that morels and asparagus make their initial emergence at the same time; apparently from the strength of the sun warming the soil enough to trigger growth. This also coincides with the first Ruby-throated Hummingbird sighting of the year. 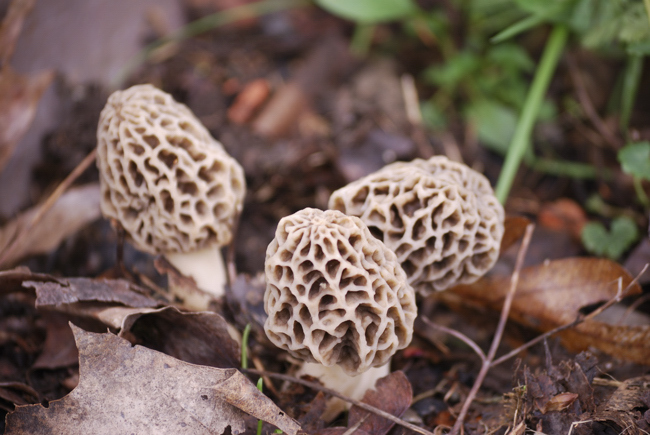 Now don't go out and expect to find a full-grown edible morel at this time. You need to know exactly where they are, just to see them barely peeking through the grass. It will be a week or more before they are of picking size. But when the first asparagus pokes through the soil, so does the little bald head of the morel. It is now time to put out your hummingbird feeders too. When is this magic day ? Here, in my yard it is April 18-20, the true first day of Spring.